Ties forged between unions and green groups during the six-week strike may have bolstered the foundation for one of history’s most necessary alliances. 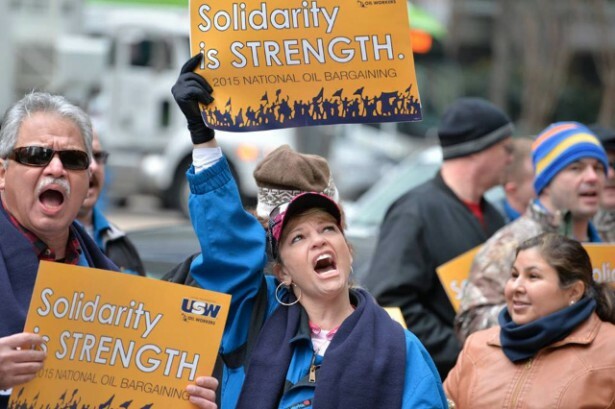 Yesterday afternoon, the United Steelworkers reached a tentative contract agreement with negotiators from Shell Oil Co., which has represented Chevron, ExxonMobil and other oil companies affected by the union’s now nearly six-week strike. Even as the strike continues in many workplaces, yesterday’s victory is the hard-won result of careful organizing and some promising collaboration. Beginning on February 1 — after a particularly contentious round of negotiations — an estimated 3,800 workers kicked off a strike action across nine refineries in Texas, California, Kentucky and Washington. As of Thursday’s truce, the strike had grown to include 7,000 workers across 15 refineries, petrochemical and cogeneration plants, including the nation’s largest refinery in Port Arthur, Texas. In total, the United Steelworkers, or USW, represents 30,000 members, and holds leverage over an impressive 64 percent of the United States’ refining capacity. Although the oil workers brought demands around wages and benefits, union negotiators’ central demands were for safer working conditions and a scale-back in companies’ hiring of non-union, often temporary workers. Chiefly, Hancock said, health and safety concerns were “key in this round of bargaining.” Long hours, scant safety regulations and lax training requirements — the oil workers argued — have contributed to workplace environments harmful to not only employees, but the communities surrounding the plants and refineries where they work. A press release by the USW yesterday stated that the proposed contract includes “calls for the immediate review of staffing and workload assessments, with USW safety personnel involved at every facility,” as well as “daily maintenance and repair work in the plants,” yearly wage increases, a joint review of plant staffing needs, and an agreement that hiring plans be developed “in conjunction with recruitment and training programs.” Negotiators had rejected seven previous contract proposals from Shell before Thursday’s agreement. In addition to the strike, workers took part in an ongoing series of rallies and guerrilla film screenings at refineries and corporate headquarters. One delegation of workers traveled to Europe to garner international support for their actions; alongside the British union UNITE and Divest London, oil workers demonstrated outside a speech by Shell CEO Ben van Buerden in the British capital. USW Local 675 in Torrance, Calif., took a particularly creative route, delivering a pile of horse manure to ExxonMobil offices in response to the company’s failure to respond to inquiries about the health impacts of a mid-February refinery explosion that left four workers injured. Due, in part, to the environmental concerns posed by unsafe refineries, strikers quickly gained the support of green groups, including the Louisiana Bucket Brigade, the Sierra Club and Communities for a Better Environment in the Bay Area, which walked the picket line with workers at a Tesoro refinery in Martinez, Calif. Joe Uehlein, a long-time unionist and executive director of the Labor Network for Sustainability, urged fellow environmentalists to support USW workers in a statement released at the strike’s onset. Hancock echoed this sentiment, noting, “The workers are like canaries in the mine … They can see what’s going on and what happens before something tragic happens.” She also saw environmental groups’ support as a major boon to the strike. “It is encouraging to other unions to see that working with environmental groups helps you in your bargaining strength and in improving the work situation for the workers,” Hancock told me. Notably, the United Steelworkers were a founding member of the Blue Green Alliance, which seeks to unite “America’s largest labor unions and its most influential environmental organizations,” according to the group’s website. As collective bargaining comes under fresh attack by Republicans in Illinois and Wisconsin, the oil workers’ victory this week might be one of the month’s most hopeful headlines — especially with regards to organized labor. Amid dropping oil prices and divestment campaigners, fossil fuel companies, now more than ever, are on the defensive. Given the not-so-secret ties between fossil fuel magnates and the GOP, ties between unions and green groups built during the strike could well have just bolstered the foundation for one of history’s most powerful — and necessary — alliances. This story is very misleading. The USW failed it’s members. Too many workers crossed the picket lines for the strike to be effective. They settled for almost exactly what was offered before the strike.